← Quick, Make Like a Statue! I don’t keep my bird feeders out in the summer, but I do feed in the winter. With all the recent snowstorms, I’ve been putting extra nuts and seeds out in the yard to help the birds survive the extreme weather. And I’ve been rewarded with quite a treat: the blue jays have been here in rowdy gangs, giving me lots of opportunities to observe them. These jays are one of our most common resident species, and I think because of that, we don’t often take much notice of their comings and goings. But I find it’s sometimes rewarding to make a concerted effort to pay more attention to a common species than the more “exotic” transient birds. Something else that strikes me about these jays is that, despite being larger than most of the other feeder birds and having that loud, insistent call, they seem to be more skittish than the other birds. They’ll sit up in a tree boldly making a racket, but when they drop down to the feeders, they usually only spend a few seconds there before zipping away again, as if I’m going to run out and grab them or something. I guess it could be that they know their larger size makes them easier prey for the Cooper’s hawks who prowl through here on a regular basis. One way I’ve found to entice them to stay for a bit longer is to put whole peanuts in one of these ring feeders so that they have to tug on it to get it out. The more I think about this bird, the more interesting it becomes. Such a study in contrasts — big, noisy, and aggressive one moment, then skittish and seemingly shy the next. 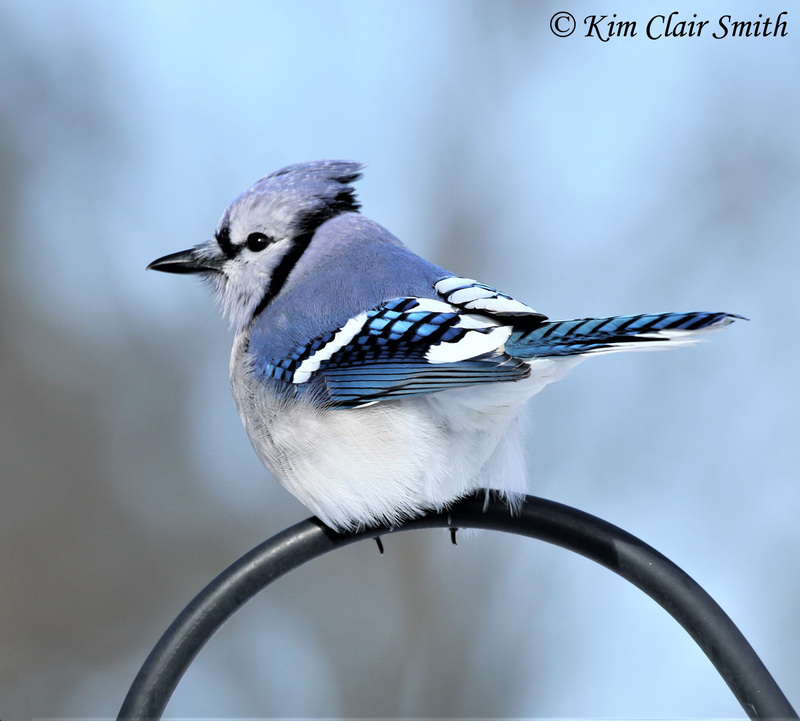 Even though blue jays are year-round residents here, we still see large flocks of them moving along the Lake Erie shore each spring. 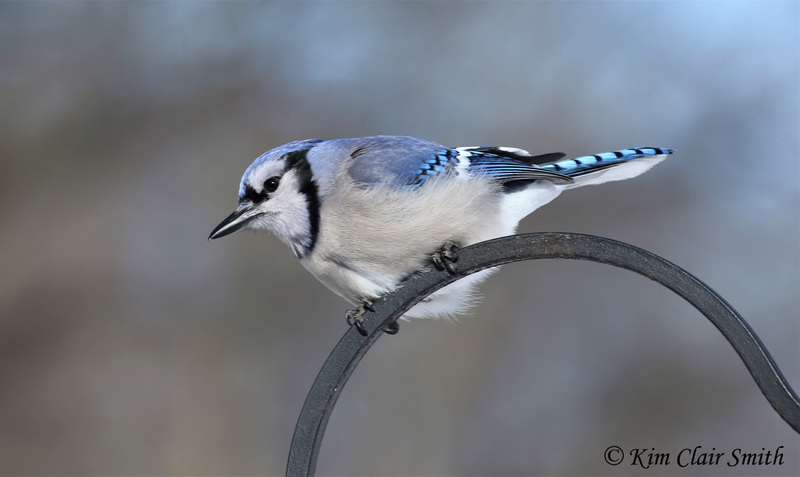 Researchers still have many questions about why some blue jays migrate and others don’t. I’ll never forget the first time I looked up and saw a silent river of blue jays streaming along the shore just east of Toledo. There were hundreds of them in a long, narrow avian ribbon, flowing from west to east, not making a sound. Such a fascinating contrast to the noisy birds that visit my yard! Learned something new about blue jays! They are so pretty. Always glad to be able to teach my mama something, LOL. Very nice Kim! 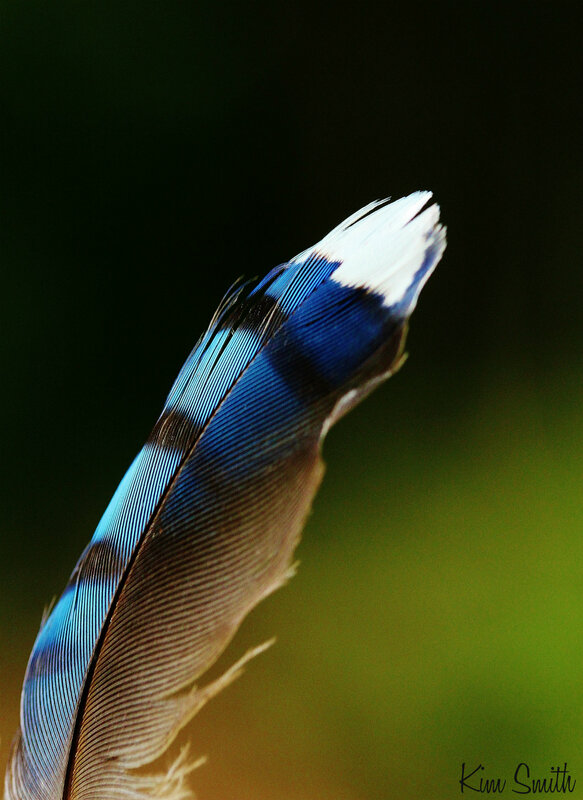 Especially liked the feather image! 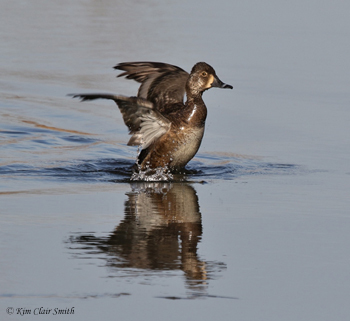 Your photographs are outstanding, Kim! We have Blue Jays here all year long and I find them a delight to observe. I’m glad you explained about the blue feathers not truly being blue. I have told more people about this (you mentioned this in a comment on my blog recently) and no one I’ve talked to knew about this phenomenon. Thank you for educating me so much!! You are my bird guru!! Haha, Lori, I love being called a bird guru! The whisper song of.the Jay is an interesting sound. I think I have attributed this to Starlings before. I will have to pay closer attention this summer. Lisa, yep, most people would never attribute that series of sounds to a blue jay. But once you know what it is, and can locate the bird that’s making the sounds, your brain will never forget it. I noticed the Jays are in the Corvidae family, along with Crows and Magpies. I believe Corvids are thought to be some of the smartest of all birds, certainly the Crow is. We have Pied Butcher Birds here, that are very closely related to Magpies and they have the most gorgeous song. I would have never known that Jay song if I hadn’t heard it, it doesn’t really sound like most bird songs. Thank you, as always, Kim, for an enlightening post! Blue or not, Jays are stunning looking birds. Ardys, yes, they are very smart! They are able to perfectly mimic the call of a red-shouldered hawk, and I’ve seen very experienced birders get fooled by that occasionally.